For 64 years, National Make It With Wool (NMIWW) has been promoting and recognizing excellence and creativity in the construction of wool garments. Each year they sponsor a national sewing and design competition for young people and adults. Entrants compete at the state level and two finalists from each state move onto the national competition. Their goals are to promote beauty and versatility of wool yarns and fabrics and foster creativity and good sportsmanship. Wild Ginger Software has been a proud sponsor of the national competition for many years now. My husband Paul and I have both had the pleasure of being judges at the national competition. Paul even got to emcee the national fashion show one year. This organization was one of my very first inspirations as a seamstress. 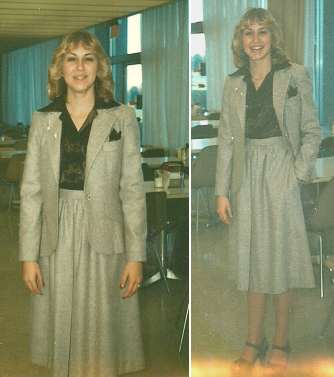 In 1978, I entered the Illinois state NIMWW competition. There I am at 17 rockin’ the Farrah Fawcett hair style and my entry. Sadly, I won third place and did not get to go on to the national competition but I thoroughly enjoyed my experience and have been so pleased to get to continue on with this great group. If you are not familiar with National Make It With Wool, check out their website at the link below. You can also read the January 2012 issue of Threads Magazine (issue 64) which featured a 6-page article on the 2011 competition. This competition is a fantastic opportunity to promote sewing and design for teachers in sewing, fashion design, and life skills related programs as well as home school associations. Its also great fun!